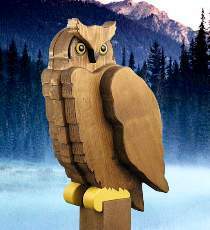 Perched in your yard, this owl will really command attention! Designed to be simple to build, yet realistic enough that it could keep woodpeckers from pecking holes in your house, or barn swallows from building nests over your entry. Here’s another twist - if the kids like the Harry Potter™ story characters, they’ll want you to paint the owl white and place it outside their window! The project is quite inexpensive to make. All body parts can be cut from a piece of "2x12". Beak and ears are cut from 3/4" stock. All patterns drawn FULL SIZE. Measures 19"H. Order one pair of yellow eyes below.